The world of Mozilla includes many Firefox related feedback mechanisms. Crash reporting, bugzilla and spreadfirefox.com represent a few such examples. 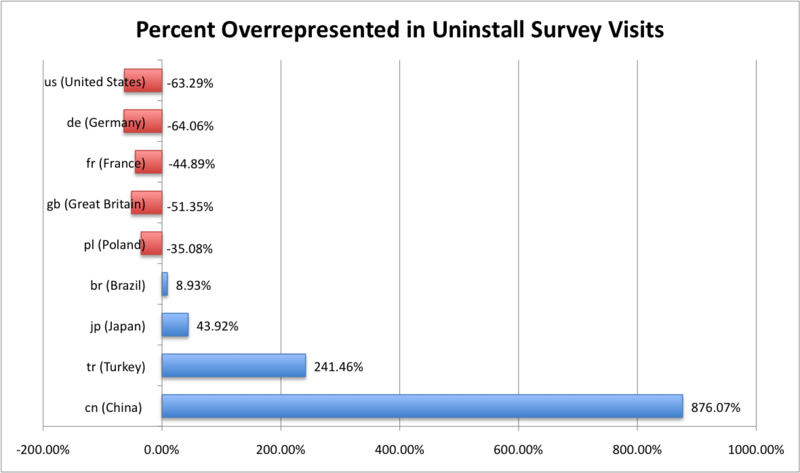 Another feedback mechanism is the Firefox uninstall survey. When a Firefox user (Windows XP only) decides to uninstall their browser, they’re asked if they want to complete a survey during the uninstall process. Often a user is merely temporarily uninstalling before immediately reinstalling. However, in some cases a user enjoys a seemingly less than optimal experience with Firefox, and in these cases, it behooves us a community to figure out what’s going on and if there are true pain points that the user is experiencing (and perhaps that we’re not aware of). Since its implementation in March of 2006, well over a million users have visited the survey. Together, they have submitted over 170,000 responses. In a typical day, we might see something in the ballpark of 4,000 visitors, 150 responses, and 40 comments. Given both the magnitude and value of the resulting information, I’ve been dedicating part of the summer to analyzing and interpreting the data. This blog post is the first in a short series. So what do the uninstallers have to say? There are two particularly interesting results, the first of which is plotted in the chart below. After the release of Firefox 2, the percent of users intending to fully replace their previous web browser declined rapidly–from 59 to 31 percent in just one year. 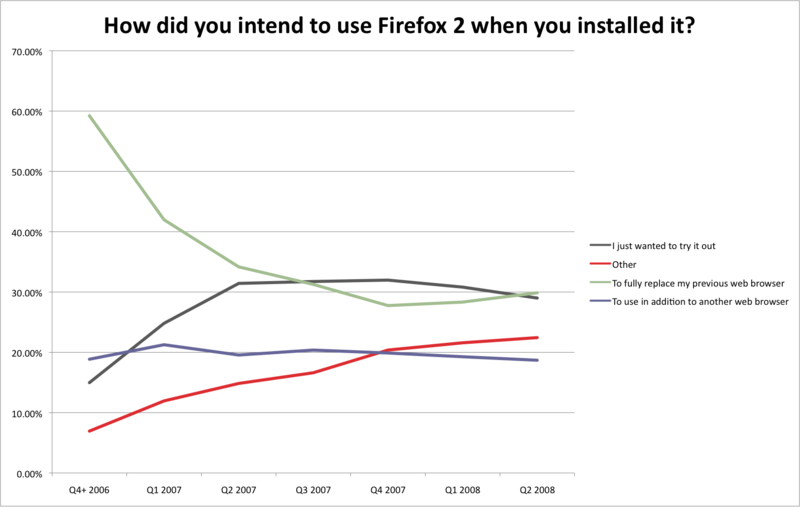 The figures for the first month of the Firefox 3 uninstall survey are very similar; 58% of respondents intended Firefox 3 to fully replace their previous browser. 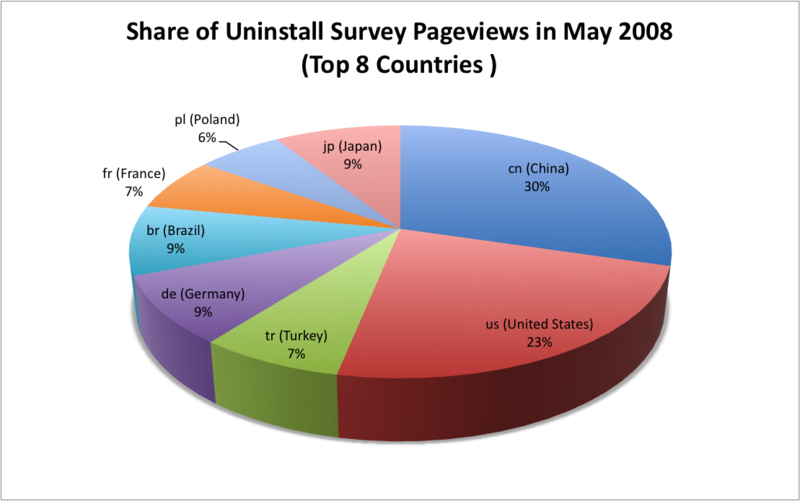 The second result concerns how well each country is represented by visits (not responses) to the uninstall survey. The charts below illustrate the degree to which each of the top eight survey-visiting countries is overrepresented. Clearly, China is the outlier. Despite comprising only 1.9 percent of active daily users, Chinese users account for 18.6 percent of visits to the uninstall survey. We are still looking for possible explanations as to why Chinese users respond so much more frequently. Are they culturally more inclined to fill out surveys? Do they uninstall Firefox at a higher rate? The survey data is publicly available at survey.mozilla.com. At this stage, we are looking for suggestions as to how to improve the uninstall survey and, ultimately, improve the user experience. Great post! Any theories for why there’s been such a drop in users who wanted to fully replace their browser? Seems like the quantity in “other” has gained. Any thoughts on why that is and the relationship between the two? If you know what Firefox is doing in China for promotiong, the result is no surprise. Most Chinese associate Firefox with VIRUSes. I think that because China is a socialist republic its citizens are more likely to contribute for the good of the project – compared to those in a capitalist society who are more likely to be happy to take something for nothing. Just an idea! I am a Chinese and in our country it’s very strange that Firefox is promoted much in the way of adware and malware. So it does not gain good reputation among users other than IT people. If plugins are required, usually Chinese online services would use ActiveX, and provide IE-only plugins, so for the vast majority Firefox is not an option here. many site administators are putting firefox ads on their sites, and they require visitors to click these ads if the visitors want to acquire more information from their sites. In order to get more money, they are desperately spreading the ads everywhere. But non-IT computer users in China can rarely switch to firefox—too many websites are IE-only, and the users may not even know how to install a software! I think it’s likely that China possesses a culture of bureaucratic obligation much more so than other countries. Standing in lines and filling out forms is just the way it’s done. It may enter fewer people’s minds *not* to fill out the survey. I wonder how the proposal towards the survey is worded. I run Mozilla Corp’s China office so I know what we do. We do not engage in, or support, or identify with, such malicious promoptional behaviors. We believe that those malicious “promotions” of Firefox mentioned in this forum is driven by people whose sole purpose is pushing the Google Pak (and Firefox) in order to get Google’s promotion payout. While Google’s promotional effort has helped Firefox increase its market share in China,the available cash inevitably attracts certain ill-intentioned people. This is not unique to China. This situation is present in all parts of the world. We encourage everyone to report such malicious sites and promoters to Google (via Google’s website). If the cash is turned off for these bad guys,they will lose the incentive to cheat. How does the results distribution break out just for China? Do they usually write comments, if so, are their comments different from the whole?